It is an Art Deco “Skyscraper” skyscraper located at 1065 Florida St. in the barrio of Retiro, overlooking Plaza San Martín. It was designed in 1934 by the local architects Sánchez, Lagos and de la Torre and was inaugurated in 1936. The building is characterised by the austerity of its lines, the lack of external ornamentation and its large prismatic volumes. It was declared a National Historic Monument in 1999 and is one of the most impressive architectural masterpieces of Buenos Aires. Standing at a height of 120 m, it still retains its impact against the modern skyline of the city. In 1939 its facade received an award from the American Institute of Architects. It was commissioned in 1934 by Corina Kavanagh, who invested all she had inherited in building her own skyscraper. The Kavanagh building has a towering form, with symmetrical setbacks and gradual surface reductions. It was created from the outside in, adapting outstandingly comfortable facilities to the space available. The structure was carefully designed to be as slender as possible, in order to avoid unnecessary weight, and the design was also influenced by the city planning regulations. 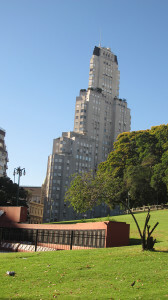 The design is an hybrid of Modernism and Art Deco style American skyscraper, with a Rationalist approach, and is considered to be the apex of early Modernism in Argentina.